Legos soak in a soapy bath. (left). My bare feet touch damp, clean Legos that are set out to dry on beach towels. (right). All Images iphone. My husband returned from North Carolina with three pillowcases full of his childhood prized possession: his Legos. He had been at his parent’s house on the East Coast for the past weekend helping them clean and organize 40 some years of their past when the toys were found. James, my in-laws’ little neighbor boy that shares the same name as my husband and is drawn to him because of that fact among others, was present when the cardboard box containing the plastic loot was found; he was as excited as the adult James, when the Legos were uncovered. Alas, the tiny jewels made their 2,500-mile trek on Southwest Airlines from the cozy North Carolinian home nestled in 47 acres to my city house in Las Vegas. My husband Jim’s face lit with excitement as he pulled each pillowcase from his suitcase, holding one hand at the top and another at the bottom cradling the weight of the loot. Each bag could have been carrying solid gold pirate coins. As fantastic as his bounty was, we did not have anyone to play with them. Also, the collection, which was originally handed down to my husband from his cousin in a similar sack, was in a desperate need of a proper rinse. Grass, spider webs and lint had jumped in with the toys throughout the years while they were stored in North Carolina. The cloth sacks remained in my garage for nearly a month. I purposely left them where they could be seen because I wanted to complete the task in a timely manner. I’m a tidy person, and I like to keep things organized. The calm, quiet and relaxing day, today, was as good a day as any to clean. I started with grabbing eco-friendly soap, a giant tub, a colander, several beach towels, and the sacks of treasured Legos, of course. I went out back by the pool and dumped a sack into the big tub adding soap and water from the hose. I upped the pressure on the hose and giggled as the water sprayed out onto my bare legs, and the littlest of Legos–the one-section bricks, Lego people heads, small weapons and the like– floated to the top first. I started taking photos with my iphone because I am a photojournalist, and the fun continued. After I had a full bath of Legos submerged in suds, I slowly poured them out into my biggest colander, dumping all of the sudsy water in the process and rescuing the jumpers back to the bowl. I returned the Legos to the wash basin, and added water a second time for a proper rinse. For this rinse, I upped the pressure, and moved the running water from the hose in a clockwise action to mimic a spin cycle. Once the tub was full again, I strained the Legos a second time, shook out the water, and dumped them onto a towel, spreading them out to dry. I repeated this processes several times with each bag of Legos. After a good sweat and soaking later, my chore was complete. All 1 million of the plastic shards were as clean as skillfully possible. Okay, I did not count the loose Legos. Who does that? Currently, the little guys are baking in the warm sun with a heavy towel over them to prevent any from getting up and walking away in the light breeze. What started out as a task I wasn’t looking forward to, ended with great joy. Even though I wasn’t building sky scrapers or castles, I was letting the Legos swim; I inspected individual pieces, I broke apart structures that my husband’s little hands had created long ago, and I was getting that warm and fuzzy feeling in my tummy thinking of my husband, little Jimmy, growing up in an awesome and loving home. I think every adult day should start off this way. This morning I played with Legos. * I dedicate this post to O’s and S’s mommies, respectively, and to all the mommies out there who are trying so desperately to become one. A Lego is shown in the colander. (left). 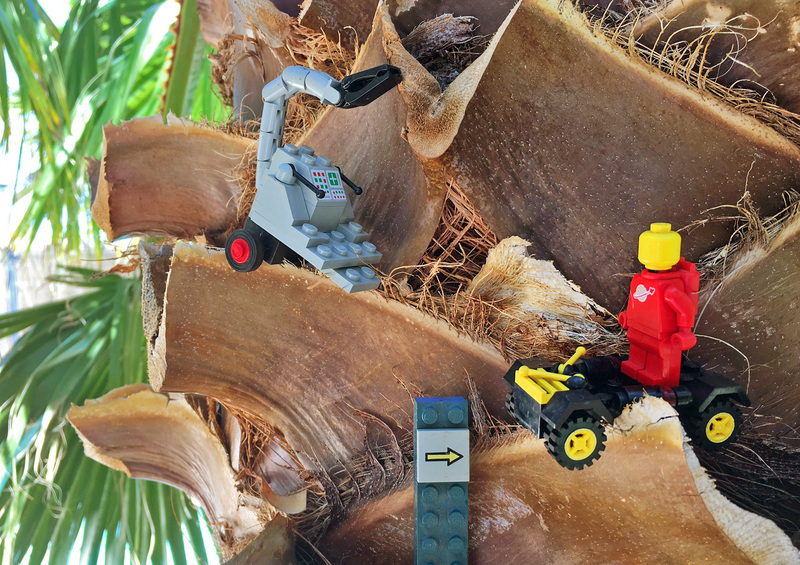 Legos receive a spray during their “spin cyle”. (right). Like-new Legos in their old configurations. This entry was posted in Personal Work and tagged childhood, Lego, Legoes, motherhood, springcleaning, toys on May 19, 2017 by rkchurchill.